Nothing better than Schweddy Balls, right? It’s one of the funniest things I’ve ever seen. During Saturday Night Live’s most recent heyday, one of the stand-out skits was Molly Shannon and Ana Gasteyer’s Delicious Dish segment. A parody of public radio cooking shows, each episode was laced with sexual innuendo, terrible jokes, and the best deadpan delivery I’ve ever seen. The most famous skit, of course, was Delicious Dish’s segment on Pete Schweddy and his delicious Schweddy Balls. Well, now you’ll be able to eat Pete Schweddy’s balls for real, and you have Ben & Jerry’s to thank. 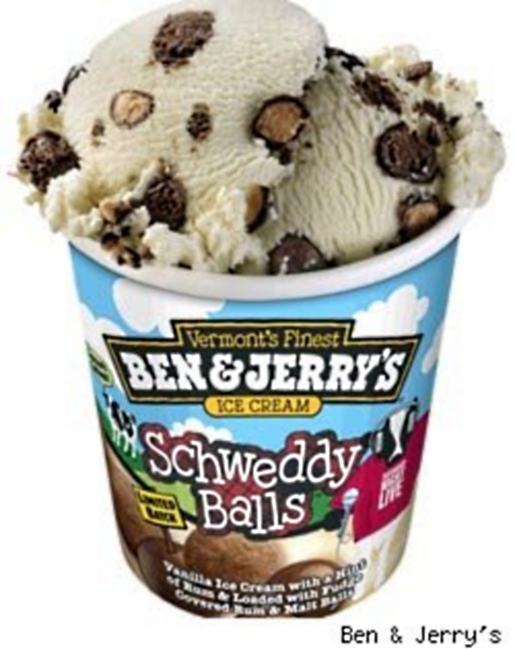 Ben & Jerry’s will be releasing Schweddy Balls ice cream. Fortunately for ice cream lovers, Schweddy Balls contains no breast milk and is not based on fish and chips. Instead, Schweddy Balls will feature premium vanilla ice cream with a hint of rum, studded with fudge-covered rum balls and milk chocolate malt balls. Sounds like it’s going to be pretty good ice cream, despite the name.